1965 & 1966 Powder Coated Battery Trays! 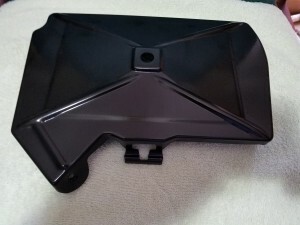 Photos of Powder Coated 66 Full Size Battery Trays! Just back from the powder coater. 1966 Full Size Battery Tray. These are photos of one of our prototypes. Cost is $139.95 plus $14 USPS Priority Mail in the US only. World-wide at cost. Taking pre-orders for delivery late January-early February. Check or money order preferred. Will take PayPal with 3% kicker. Mail to PontiacParadise.com, 12501 Danbury Way, Rosemount, MN 55068. PayPal to oldschoolhotrodz@gmail.com. Price for the same for 1965 Battery Tray. If you want either of the trays bare, they are $119.95 plus the postage. 65 trays start shipping next week. BTW, your check or money order will not be cashed until the parts ship. Thanks for the overwhelming response. 65 and 66 Battery Trays! Update! 2 New Repro Items Coming!!!! PontiacParadise.com announces two new badly needed reproduction items coming soon! #1 is 1964 Catalina quarter panel clips with water seals, made from NOS clips in a superior nylon material. These are curved. The clips on eBay are beyond wrong. Door molding clips are right behind these. 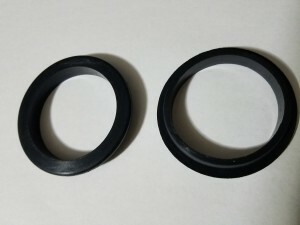 Those are straight with water seals, again made from NOS clips. #2: 63 to 64 filler neck gasket. This goes at the top of your filler neck and keeps it from rattling up by your gas cap. These are always hard and crunchy. Again, made from a superior rubber, all items are made in the USA! Pricing to follow. Happy New Year to all! 1964 Catalina Quarter Panel Clips Coming! Coming soon from PontiacParadise.com! CORRECT Reproduction 1964 Catalina or Star Chief Quarter Panel Clips. Beware that EVERY 1964 Catalina quarter panel clip on eBay (all 16 listings!) are WRONG. 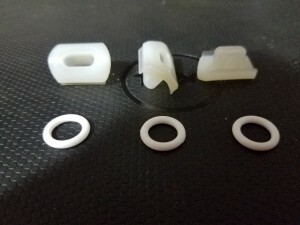 Our clips are made from our NOS clips and are made from a superior nylon material and come with a superior o ring that seals the clip to prevent water getting into your car. The photo is of the prototype clips we received today. Pricing to follow as are the door clips (not curved like the quarter panel clips) are coming soon! 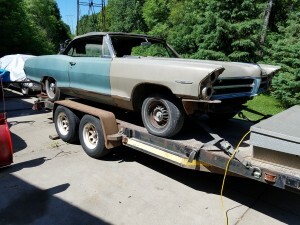 1964 Pontiac 421 Engine, 43N Code Complete! 1964 Pontiac 421, 320 horse engine. 43N code. Complete with all accessories as pulled out of car. 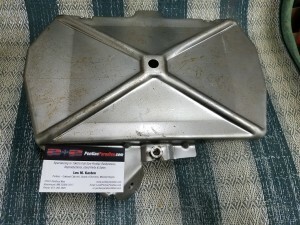 Power steering, alternator, air cleaner…etc. Stuck from sitting. As with ALL 421’s, this is a 4 bolt main engine. Block casting number 9773157, heads are 9773345. Can load into your vehicle or can ship via Fastenal in Hastings or ship via EnginesDirect.net. Additional cost to build pallet to hold engine correctly if shipped. $4000 firm. Photos up soon. Thanks for looking! A long story about a neat car……. In 2004, I answered an ad in the Mpls. paper for 1965 Pontiac 2+2 convertible. The car was a GM Exec car loaded with options from Alabama. I purchased the car from a person in Burnsville, MN and it came with a 1965 Catalina convertible “parts car”. I held on to both for over ten years, planning to only do the 2+2. This story is not about the 2+2 although it in itself, is a rare car as well. The more I learned about the 2+2, the “back story” to the parts car started to be unfold. The PHS documents for the 65 Pontiac 421 green convertible show there were only 754 cars built with this spec. 421 Special Equipment 421 HO, Auto, 3-2 bbl, YK engine code. The car had a tilt column and has 8 lugs, neither showed up on the build sheet. The Catalina parts car came to me minus the engine, front end, left door, the windshield and most of the interior. The frame looked good but the dash board and steering column were really bent up. The car was built in Kansas City, KS in June of 65. It was mint green with a black bench seat interior. The car had been stripped of a number of parts however I could see it was repairable. Shortly after I purchased both cars the story of the green car started to come out. The car was bought new by a Mpls. Fireman in 1965. He wrecked the car in September of 1966 with 1780 miles on the speedometer. He hit something really high and the engine tore loose hitting the firewall. He was propelled into the steering column and the dash board and lost his life. The story goes that his wife had the car towed home and locked the car in the garage for the next 30 years. Finally, for reasons unknown, the car was sold. The car ended up for sale on Lake Street in Mpls. for a time. The car had acquired a white 66 front clip by this time. The car then disappeared for years re-emerging with no front clip and parts missing as stated above. The right front passenger side floor pan had also rusted thru. Here is where I came in. The car had an automatic transmission, power steering and brakes, power top and 8 lug wheels. So I kept the car thinking it would be parts for the 2+2. I sold both cars in 2015 to my friend Peter. Peter had expressed an interest in repairing the 2+2 and the Catalina. Meanwhile, in a closer inspection of the car, I found it had a Saf-T-Trac rear end and had 2.5” exhaust all the way back. Peter PHS’d the car and my suspicions were confirmed. The car came with a 421, 376 horse “YK” 3-2 engine. What the car did not show on the build sheet, was the tilt column (maybe dealer installed?). Peter started accumulating parts for the car, as did I for Peter. Many hours were spent trying to decide which way would be best for car. Original, 4 speed it, put bucket seats in….many things were considered. The car was sent to “The Works” in Fridley, MN and a spare front clip was installed on the car as was a spare left hand door. 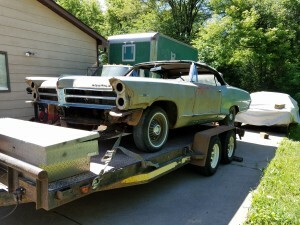 During this time, Peter purchased two other cars, one being a 1964 Pontiac Catalina, 421, 4 speed, 2 door hardtop (a former show car that was custom painted by House of Kolor’s Jon Kosmosky in the later part of the 60’s), of which I am currently doing the engine rebuild and supervising the project for Peter at “The Works”. The other being a 1965 Pontiac Bonneville convertible with factory AND a factory 4 speed. The work has not started on this car except for the engine and transmission rebuild. This car came from infamous Pontiac car collector Jon Fiedler from Pasadena, CA. Needless to say, Peter’s plate was and is quite full! Hello: It is a very small world when it comes to old cars and especially old Pontiacs. I know this car! I just returned from Minneapolis earlier today, where I had been for 2 weeks. I had lived in Minneapolis for most of my life and moved to Oregon in 1995, but a friend of mine had told me of this car about 12 years ago. He had discovered it in a garage in South Minneapolis and told me the story, I nearly bought the car as I am a Pontiac fan with many cars in my collection including a 65 Parisienne convertible. My friend actually was the one that bought the car from the original owners, then sold it to another local buyer. Dave said that the story he got was that the car was crashed when it only had just over 1000 miles and it simply got stored away. It had been in the garage for over 40 years and when he got the car it had a 66 front on it , just crudely bolted on. It had the original motor at that time. I asked him to check into finding out what happened to the motor and he is working on that as he is a tow truck driver and occasionally tows for the shop that bought the car from him. Hi Peter: Yes this was the first time that I saw the Catalina. Steve, who will be sending the fenders found the car back in early 1980s as he would ride his bicycle thru the alleys of South Minneapolis long before he had his drivers license and look for cool old stuff. When he saw the car back then it was in a very dilapidated garage and had been there for probably 15 years already. My friend Dave first knew of the car when he saw a hand written add for the car on a bulletin board and immediately went to buy it. He offered it to me, but already having so many cars and living almost 2000 miles away in Oregon, I decided against it. At that point it did have the motor which in hide sight I obviously should have purchased the whole car at that time. It then got sold to a repair shop whose owner knew enough about Pontiacs to grab the motor, then he resold it and the trail went cold until Les bought it. -Lower dash (with ignition switch) Need from side to side, spot welded in, either drill spot welds or cut outside of spot welds and we will drill. 1966 Full Size Battery Trays! Pricing/Delivery Date here! OK, price on the 66 Battery Trays will be $119.95. Increased tooling and production costs drove the price up. Also we are only doing 150 trays in this first run. We strongly suggest you order NOW. Shipping date will be Jan 1st, 2019. Postage will be $14.00 USPS Priority Mail in the US only. World-wide at cost. 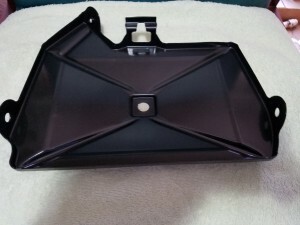 1965 Battery Trays Coming Soon Plus More! 1965 & 1966 Battery Tray Update! Plus more! 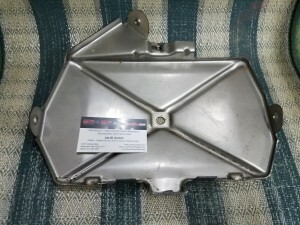 We will be making a new run of 1965 Battery Trays (65BT) around the middle of November. 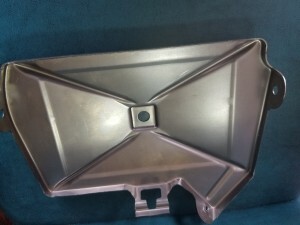 As before, they will be an exact reproduction of the original tray. 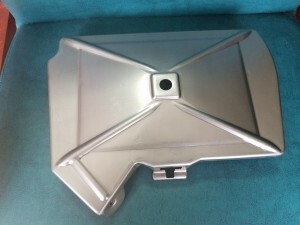 We have also commissioned the tooling for the 1966 Battery Tray (66BT) and hope to have these ready to ship around Christmas 2018. Pricing will announced soon. Thanks to all that have waited patiently. The tooling costs are very pricey. We will be taking pre-orders starting November 1st or when pricing is available.